Alarming statistics that show large declines in the employment and labor force participation of Americans with disabilities are often cited to support the claim that workers in poor health but able to work are increasingly opting out of the workforce to claim disability benefits. However, these statistics don’t account for a weak labor market, an aging population, the rise in women’s labor force participation, or problems with self-reported disability measures. If one takes these factors into account, there’s no evidence that more workers with comparatively mild impairments are exiting the workforce to claim disability benefits. If workers with disabilities were leaving the workforce in larger numbers than healthy workers for reasons such as easier access to benefits or greater financial incentives for applying, we would expect them to be a growing share of the non-working population. This is generally not what we find. 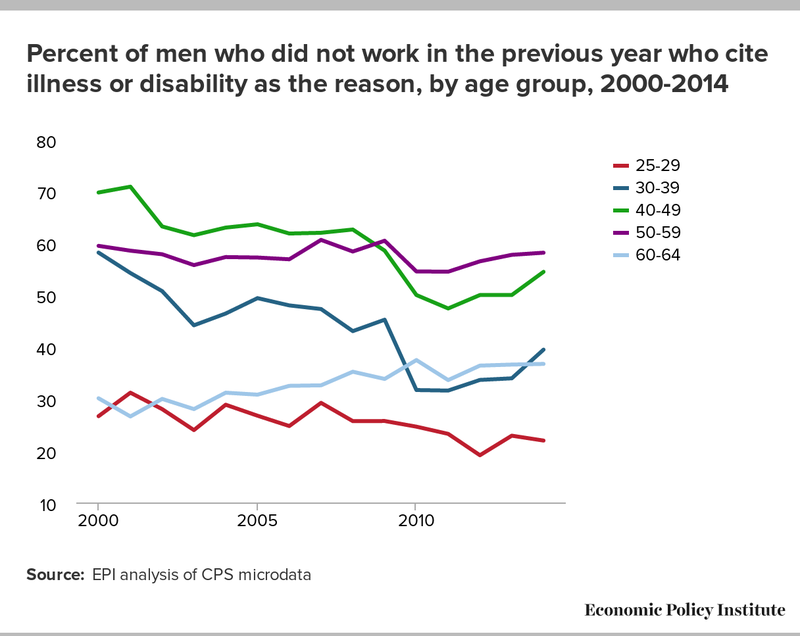 Men with disabilities are a stable or declining share of non-working men, as shown in the chart below. The exception is men in their 60s—but this is because fewer men in their 60s are retiring, not because more are leaving the workforce because of a disability. A similar pattern is observed for women. 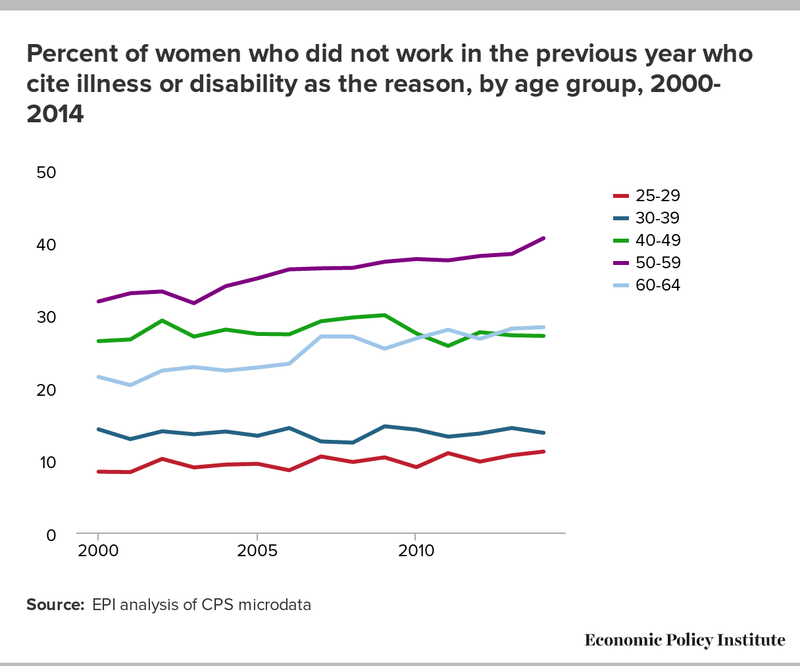 For the most part, women with disabilities are a stable share of non-working women, though there has been an increase in the disabled share of non-working women in their 50s and 60s. This increase may be because of the rise in women’s labor force participation, as well as the trend toward later retirement; since more women in their 50s and 60s are in the workforce, there are more women to report a work-limiting disability. In 2000, 42 percent of women in their 50s who weren’t in the paid workforce cited caring for home or family as the reason. This share declined to 33 percent in 2014. As the pool of non-workers shrinks and the share of women who cite caregiving for the reason they aren’t in the workforce declines, the share of women who cite disability as the reason for not working will go up. Indeed, the decline in full-time caregiving explains more than a third of the increase in the disability share for that age group. Admittedly, even if the employment decline is limited to older women with disabilities, older adults are the bulk of the disabled population. So it could still be problem if more older women are exiting the workforce to claim disability benefits. However, as noted in an earlier blog post, Social Security administrative data show no upward trend in age- and unemployment-adjusted disability take-up over the past 20 years, as a modest decline for men has offset a modest increase for women. Moreover, the increase for older women is due in large part to trends in labor force participation, as, over time, more women in this age group had worked long enough to qualify for benefits. CPS data generally corroborate administrative data on disability receipt. What explains these seemingly contradictory trends? Has a weak job market had a stronger-than-usual effect on workers with disabilities? Are adults with disabilities leaving the workforce for other reasons? If so, why isn’t that reflected in SSDI take-up and other statistics? There are a number of possible explanations, none of which suggests that more workers are leaving the labor force to claim disability benefits—at least not in the past 20 years. One possibility is simply that a growing number of workers with disabilities have found themselves with neither jobs nor disability benefits. As noted in an earlier blog post, research focusing on marginal disability applicants who might be accepted or rejected by different examiners shows that a large majority—whether accepted or rejected—are never able to earn a living again. Though this is a real concern, it’s not clear that it’s a growing problem, properly measured. The statistics cited by Yin, Shaewitz, Biggs, and others don’t take age distribution into account—a significant omission in a period when the large baby boomer cohort entered their peak disability years. The aging of the baby boomers caused an increase in the share of adults with disabilities as well as a decline in the employment rate of workers with disabilities. Younger people with disabilities are more likely to be employed than their older counterparts, many of whom exit the labor force at the onset of disability. Between 2000 and 2014, 21% of Americans with disabilities age 25-49 were employed, compared to 14% of those aged 50-64. Another explanation is the subjective nature of self-reported disabilities, as opposed to disabilities that meet SSDI’s eligibility standards. The CPS simply asks whether respondents have “a health problem or a disability which prevents him/her from working or which limits the kind or amount of work.” Because the definition is broad, roughly twice as many people say they have a work limiting disability in the CPS as receive disability benefits (SSDI or SSI). These issues led the National Council on Disability to discourage the use of CPS data for assessing employment rates among people with disabilities, expressing concern that it could lead to ‘‘ineffective or even dangerous public policy decisions” (for a discussion, see Silverstein, Julnes and Nolan (2005)). Along with Massachusetts Institute of Technology economist David Autor and Stanford economist Mark Duggan, Cornell economist Richard Burkhauser is a prominent expounder of the idea that employment rates for Americans with disabilities are declining. Burkhauser and various coauthors, who have considered the issue in more detail than others who hold similar views, acknowledge the limitations of CPS and other survey data—though, like them, Burkhauser fails to account for changes in the age distribution of the population. One of the problems with self-reported disabilities acknowledged by Burkhauser is that “those reporting a work-activity limitation are less likely to be working, because those who are not working will be more likely to report that their impairment also affects their ability to work.” Thus, for example, an unemployed waitress suffering from arthritis might describe herself as having a disability after an unsuccessful job hunt, but not before. As a result, the employment rate of people with self-reported disabilities is highly sensitive to labor market conditions, since the denominator (the number of adults with disabilities) tends to move in the opposite direction as the numerator (the number of adults with disabilities who are employed). As noted earlier, we have experienced a prolonged period of weak labor demand. In such circumstances, if even if a small number of people change their response to a survey question about work-limiting disabilities, it can have a large impact on the employment rate of adults with disabilities, who are a small share of the adult population. Assume, for example, that eight out of 100 adults describe themselves as having a work-limiting disability, and two of them are employed (this is roughly in line with CPS data for 2000). If a single “healthy” person loses his or her job and now reports a work-limiting disability, this reduces the employment rate of people with disabilities by 11 percent (from 2/8 to 2/9). Because this is more likely to happen when employment is declining, it magnifies the apparent impact of weak labor demand on the small disabled population. Similarly, a small reduction in the number of employed workers who report having a disability can have a large negative effect on the employment rate of people with disabilities. Using the same example as earlier, if an employed person changes his or her status from disabled to healthy, it reduces the employment rate of people with disabilities by 43 percent (from 2/8 to 1/7). It is likely that baby boomers who shun labels like “senior” are less likely to identify themselves as “disabled” than previous generations. A tendency for workers sidelined by a weak economy to downgrade their health status, combined with a growing unwillingness by employed workers to identify as “disabled,” could be pulling down the estimated employment rate of people with disabilities. This could theoretically happen even in the absence of any decline in the employment of people previously identified as disabled, though in practice it will tend to happen when this is occurring as well, magnifying the apparent impact of a weak labor market on workers with disabilities. It could also occur without any change in measures of disability prevalence, since the two trends have offsetting effects on prevalence. Many articles and even books have been written about problems associated with disability statistics as well as the effects of aging, women’s labor force participation, and similar factors on these measures. Many of these issues were raised, for example, in a debate over the employment effects of the Americans with Disabilities Act. While it can be difficult to disentangle these effects, the fact that neither the AIR report nor Biggs’ op-ed even allude to these challenges suggests that neither should be taken seriously.